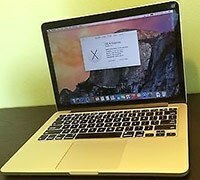 I finally sold my MacBook Air and purchase this Apple MacBook Pro MGX82LL/A, because I want to have a laptop with retina display. Other than that, there is no other laptop that is more sturdy and gorgeous than MBP. In comparison to Windows laptops, MacBooks are superior in terms of hardware. Very expensive, that’s the only downside with MacBook Pro, but I believe it’s worth your extra money for the better hardware and sturdiness. If you look for the 13″ MBP model, this Apple MacBook Pro MGX82LL/A with 8GB RAM and 256GB SSD is the best value in terms of features and price. Compared with the MGX72LL/A model (about $200 cheaper though) that has 128GB SSD this model is faster when it comes to the writing speed. And compared with 512GB it has the same performance on SSD. 128GB is not much and it’s not easy to upgrade the hard drive, as no affordable PCIe SSD hard drive on the market yet. And 256GB is more of space for most of users, as you still can use an external drive if you have large files which are seldom used. If you never used SSD computer before, SSD powered laptops are much faster than a laptop that has a standard hard drive. And you are going to be happy with MGX82LL A because 8GB RAM is what the new Maverick OS needs. Just to turn the Mavericks OS on, it eats the 4GB RAM. Yes, with 4GB of RAM your computer will work just fine, but with only 4GB, things on the memory will be constantly compressed and deleted, and this will decrease the overall performance and the battery life. Then Yosemite beta was revealed, if it is released, Yosemite OS will exceed any macs with 4GB of memory. 2. No CD/DVD drive. But I believe this leads to the thinness of the machine. 3. If you plan to use an external mouse, MacBooks have higher acceleration settings, so it will feel weird, exactly why MacBook trackpads are just the best. 1. Top quality. With this price, none will expect less, this Macbook is one of those high quality laptops that have been made. Compared to the Air and previous MacBook Pro models, this device is very quiet. The thinner bezel is just gorgeous. 2. Performance. It handles all of my daily computing tasks just like a champ. The combination of a 2.6 GHz Dual-Core i5 CPU and 256GB SSD is no joke. 3. Graphics. The GPU has a full of 1GB VRAM. The is more powerful than expected. Yes, the integrated Iris 5100 Graphics won’t run the heavy games with the best setting on FPS and texture, but tt works better than expected. 4. 9 to 10 hours battery life. After the whole day of office use (8 hours), the battery is still on 40%. 5. Screen. As I mentioned above, I sold my Air because I want a laptop with retina display. I was happy with my Air but whenever I use my Ipad 2 with Retina display, I decided to get a MBP with it. The screen is absolutely breathtaking. Everything on your screen will look stunning, richer color, more pixels, and less glare. I experienced retina display on my iPad, and it’s a nicer experience on a larger screen. The difference between retina display and standard screen is like comparing the picture quality on your HD TV and a standard television, as I love my pictures, movies media, there is no deterioration which could discourage me to pay more for it. 6. Best Trackpad. I switched from Windows OS laptops to MacBook on 2009, and the trackpad is my first reason why I prefect Mac’s trackpad. It’s just amazing, even after those years, I haven’t found any laptops that can compare the trackpad on Macs. This laptop is surely more expensive than the rest, but if you look for better quality laptop, buy this one. I compared the price in BB, Apple Store, and Amazon, at the end, best price found here, as no sales tax, and Square Trade warranty is more affordable than Apple Care. I prefer the retina display MBP than air or 2013 models, with extra money, you will have better screen, and faster processor. So if you want a fully functional laptop that has top qualities in terms of aesthetic and hardware, this Apple MacBook Pro MGX82LL/A is the device to get. Unreal, no comparison. Envy you for your new MBP. Btw, what plugin do you use for your “Similar Topics”?